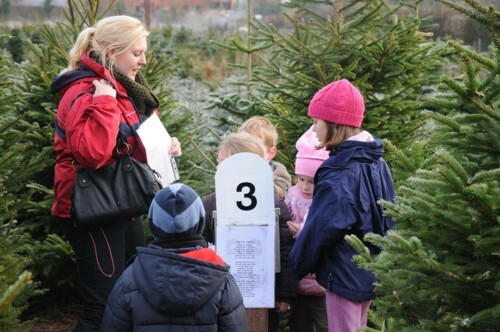 As part of our Grotto experience children can have fun in our Christmas tree fields by trying to locate our 12 days of Christmas boxes. We provide you with a map of our field that shows the pictures and numbers that the children are looking for to find the twelve days of Christmas. Children have to hunt through the trees near our guided area and find the clue associated with the day of Christmas. Once found the numbered box has a surprise inside. On the back of their maps the twelve days of Christmas baubles are printed. Each child should use the stamp from the box to complete the twelve days of Christmas on the back of their maps. Note: Our fields are extremely muddy during the winter. We advise waterproof coats and wellington boots as a minimum. Wrap up warm, take as long as you need and most important of all........enjoy yourselves!!! !